As we approach the sixtieth anniversary of China’s 1959 invasion of Tibet—and the subsequent creation of the Tibetan exile community—the question of the diaspora’s survival looms large. Beijing’s foreign policy has grown more adventurous, particularly since the post-Olympic expansion of 2008. As the pressure mounts, Tibetan refugee families that have made their homes outside China—in the mountains of Nepal, the jungles of India, or the cold concrete houses high above the Dalai Lama’s monastery in Dharamsala—are migrating once again. Blessings from Beijing untangles the chains that tie Tibetans to China and examines the political, social, and economic pressures that are threatening to destroy Tibet’s refugee communities. 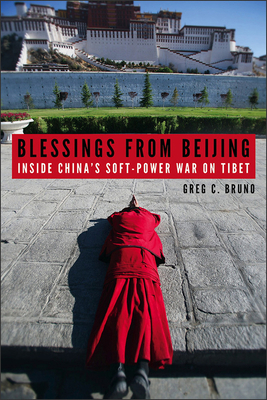 Journalist Greg Bruno has spent nearly two decades living and working in Tibetan areas. Bruno journeys to the front lines of this fight: to the high Himalayas of Nepal, where Chinese agents pay off Nepali villagers to inform on Tibetan asylum seekers; to the monasteries of southern India, where pro-China monks wish the Dalai Lama dead; to Asia’s meditation caves, where lost souls ponder the fine line between love and war; and to the streets of New York City, where the next generation of refugees strategizes about how to survive China’s relentless assault. But Bruno’s reporting does not stop at well-worn tales of Chinese meddling and political intervention. It goes beyond them—and within them—to explore how China’s strategy is changing the Tibetan exile community forever. GREG C. BRUNO is a journalist and editor whose work has appeared in the New York Times, Foreign Affairs, the Guardian, Forbes, and other international print and media outlets. A native of Vermont, Bruno has spent many years living in and writing about China, Tibet, and the Tibetan exile community. Bruno was a term member of the Council on Foreign Relations in New York, where his work on US-Pakistani relations earned him top honors from the Overseas Press Club and an Emmy nomination from the Academy of Television Arts and Sciences. He holds a degree in the comparative anthropology of China from the London School of Economics and Political Science, and is currently an associate editor at Project Syndicate. "The author gives vivid portraits of the places he visits and the many different people he meets, from the Dalai Lama himself to some of the poorest Tibetan refugees. . . . This is a very clear, honest, and readable depiction of one man’s view of what life is really like for the many thousands of Tibetans living outside Tibet and contains some unique and valuable research material."